On February 22nd 2011 Christchurch suffered a major earthquake aftershock, and a brick wall in Son of Moosey's house came crashing down. Two days after the event I was busy helping clear out the bricks, gloved and dust-masked. Those days were a puzzle, as the Moosey house and garden in the countryside had been spared any trauma. But my city had suffered - many buildings were destroyed, and there had been lives lost. I decided to build a small earthquake memorial in my garden. 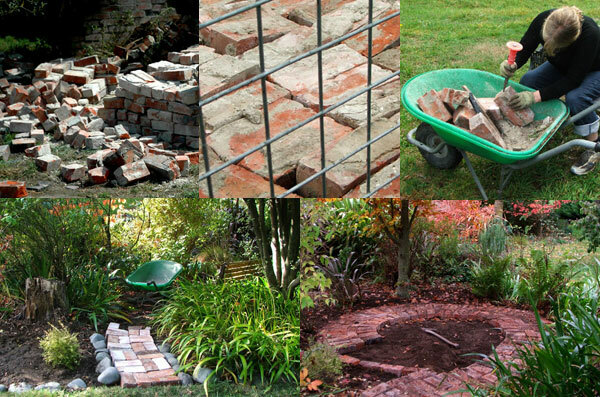 The bricks (many of which I'd shifted myself) would be laid level, so they could never threaten or hurt anyone again. I chose a Koru design. The stem would be the path, and the courtyard itself would then spiral in on itself. The Koru is a New Zealand Maori symbol of rebirth, and is the shape of an unfurling fern frond. Brick path-layers with orderly minds should now stop reading. Because I deliberately let my spiral design create itself, totally on site. I had fun spiralling into the centre, wondering how to get the oblong bricks to turn the tight inside corners. I wanted to let the bricks speak, rather than use rulers and mathematical curves. And with the help of a brick cutting tool, and rather a lot of Moosey thinking, they finally did! I've just set the bricks down in the soil (which is free-draining and sandy) and I've sprinkled sand over the top. They are not exactly level. The courtyard lies alongside a beautiful Copper Beech tree which did not deserve to have any of its roots destroyed. That's my excuse and I'm sticking to it! I did wonder if the Koru courtyard should have some focal feature in the middle - a large pot? A sundial? A statue? Thankfully good sense and simplicity have prevailed, and I've kept it unadorned. The bricks are their own feature, and they do speak for themselves. 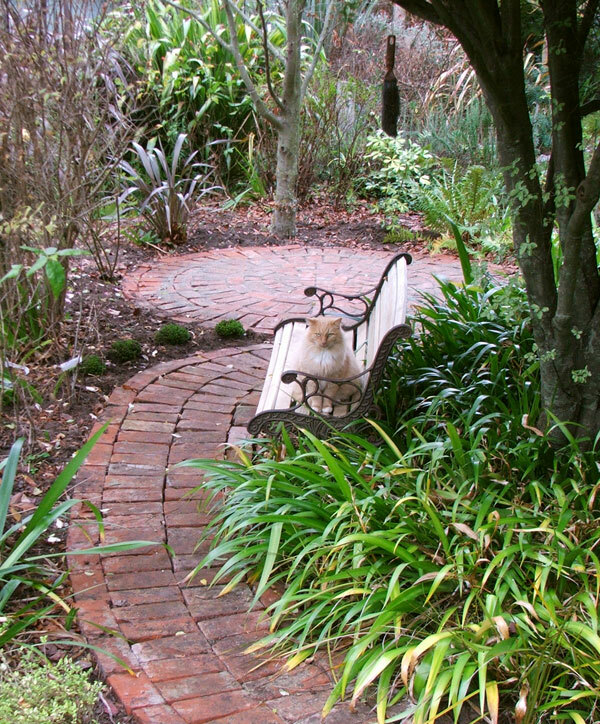 A garden bench sits alongside the path, for quiet contemplation (by people or cats). When I pass the Koru courtyard I always take a small moment to give thanks, and to look ahead with hope. 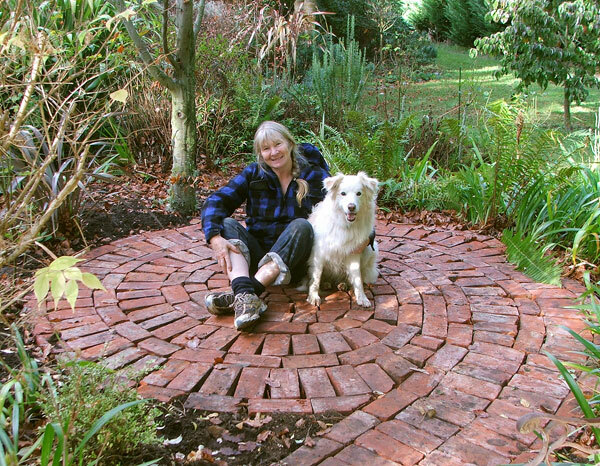 The bricks look so beautiful, safely patterned in their spiral on the ground. It wasn't their fault that their wall fell down. And thankfully my family was safe.